GradeAmathhelp is free math help that can be used by students, teachers, and parents alike. There are no gimicks, no sign-ups - just free math help resources to help with math education! You'll love our free help pages: prealgebra, algebra, geometry, trigonometry, and more. All lessons are easy to understand, and many connect to sports, movies, and life. GradeA saves you time with free printable math worksheets, creative teaching ideas, cool math games, and even an entire geometry curriculum. All parents want to help their children, and all parents want their children to succeed in math. Let GradeA help you accomplish both. Use our free worksheets to provide extra practice, or learn math together using our easy-to-understand free lessens. www.mastersthesiswriting.com is ready to assist you in Math dissertation writing. Need help finding a math help topic? Try our free math search engine for everything from pre algebra all the way through trigonometry. And the best part is, everything is absolutely free! What is the GradeA Difference? 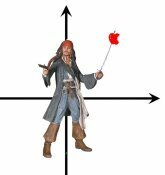 For a popular example, visit our free algebra help page to see how we teach the coordinate plane through Jack Sparrow & Pirates of the Caribbean. We know a lot of students prefer to learn math visually. Our lessons includes many pictures and even free math videos! GradeAMathHelp.com has joined facebook! See below for details. GradeA added an interactive unit circle! Enter all the values of the radian angles, degree angles and corresponding coordinates - and then we tell you which ones you go right and which ones you still need to learn! Its the perfect way to practice the unit circle - or for teachers to quickly test theirs students! GradeA updated the bingo math page. We've included a bingo card generator absolutely free! Check it out. GradeA recently added a Free Online Math Calculators page, comple with eight absolutely free calculators - all easy to use! Check back frequently for all your free math help needs! Please use the navigation bar on the left to view the main pages. Each of those pages act as hub pages for additional lessons, worksheets, and information.